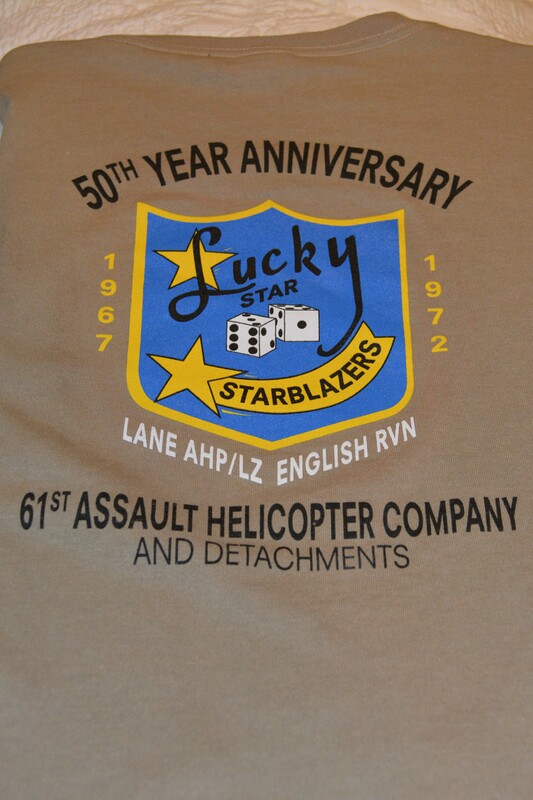 The "50 Year Anniversary" T-shirts are 50% cotton and 50% polyester blend with a front left pocket and the 61 patch top. 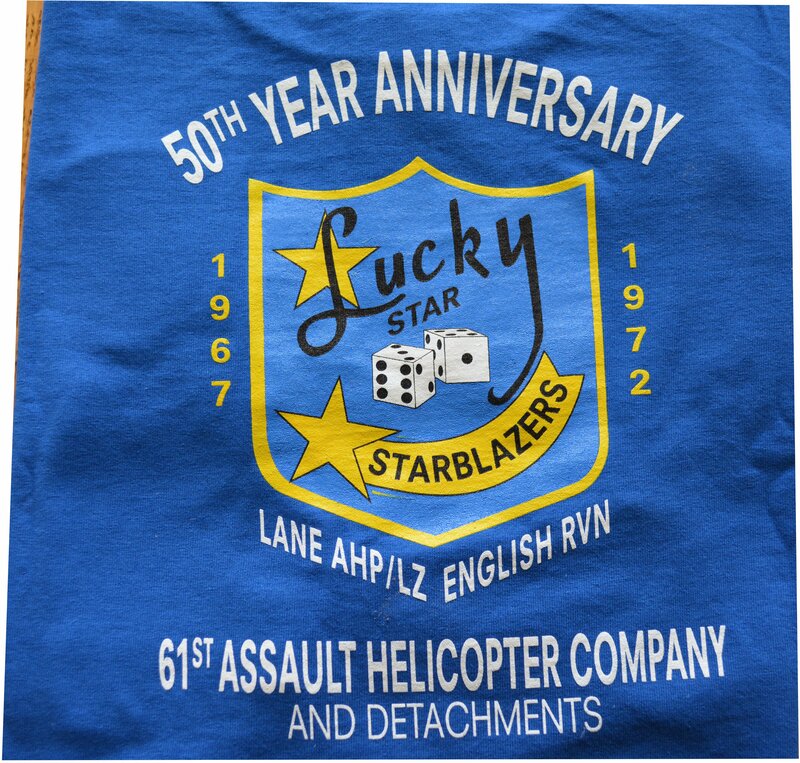 Limited quantities and sizes are now available in aviation blue and tan (as shown above)with the 61st patch sown over the pocket (now available in L, XL, and 2XL sizes. Future lots will be ordered and printed with the 61st shield printed over the pocket, however, these special orders will delayed deliveries. 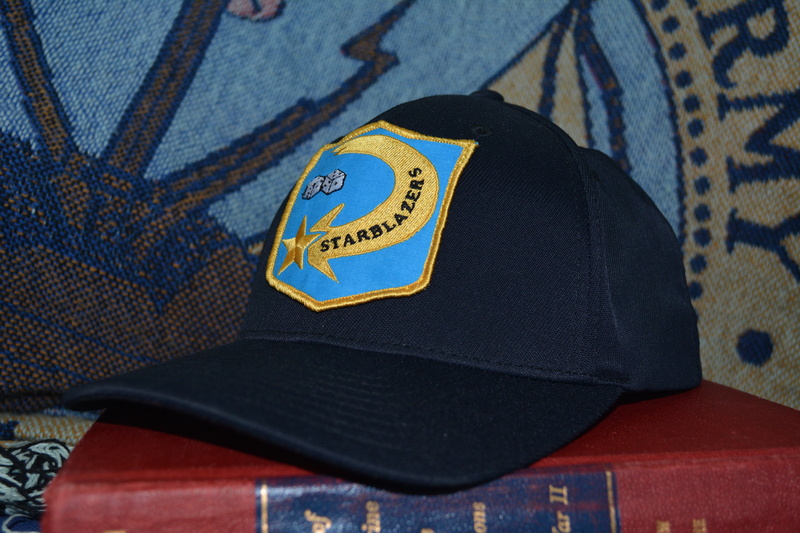 The future orders may come in black, blue and tan; with the 61st shield printed over the pocket (not a sown on patch). The $30 price includes shipping. LAUNDRY NOTE: Turn T-shirts inside out when using machine washing. 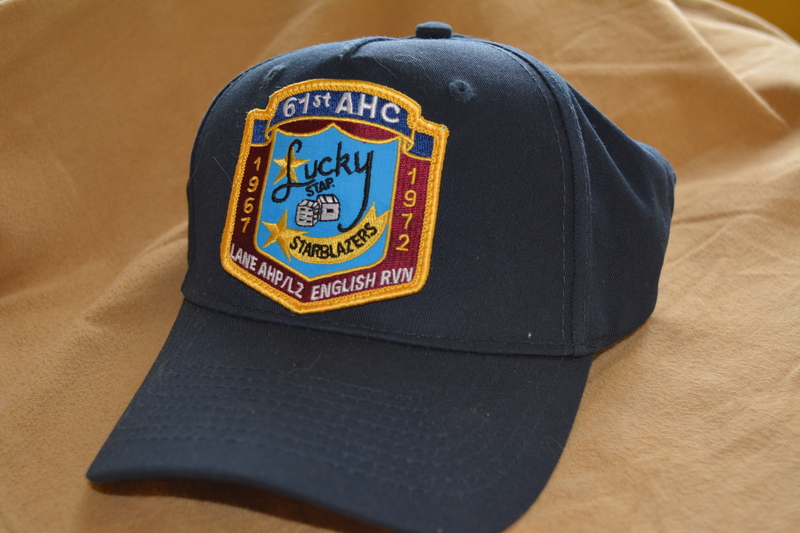 61st Baseball Cap with choice of Lucky Star, Starblazer, or 61stst AHC patch. The $30 price includes shipping. Deliveries will be delayed until minimum order quantities are reached. Delivery updates will be provided with your eamil address on the order form. 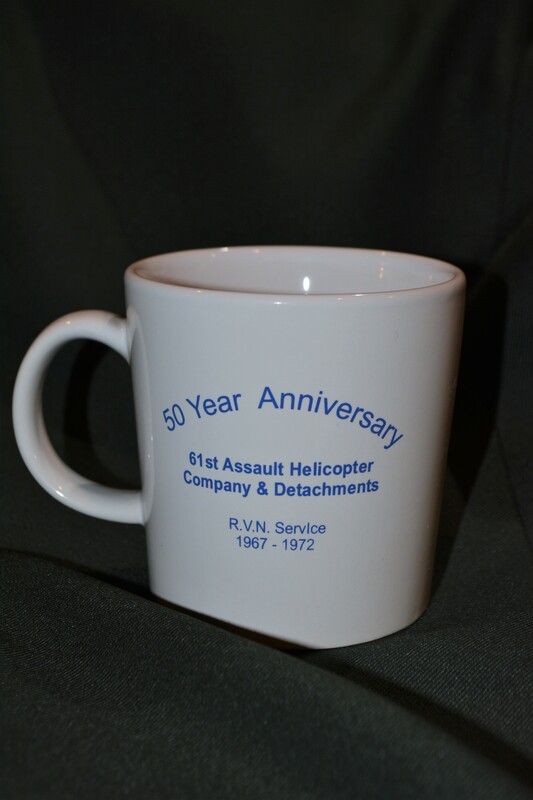 The glossy white coffee cup is a 12 ounce size. 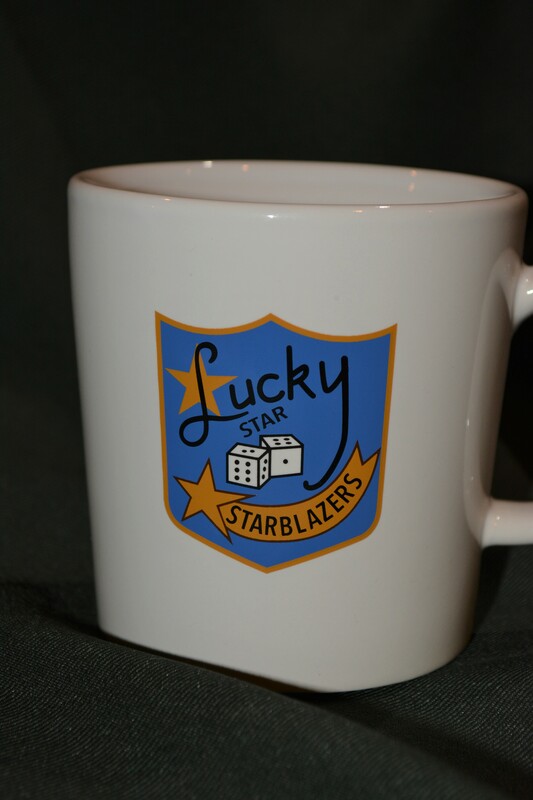 They are shipped USPS, priority 2-3 day delivery, at $18 for one, or at $28 for two cups. The shipping cost is the largest part of your order. A single cup costs just over $11 while shipping two is a little more than $14. These are a great gifts for friends and family members. Open the Order Form .pdf file then print it, write in your order, include check for total amount, and mail to address shown on the bottom of the order form. Some items are not available for immedicate shipment. Delays will be experienced when new orders are issued to the vendor. Be certain to include your email address on the order form so delivery updates can be provided to you. Credit cards are not accepted.